I don’t even know how to begin or explain what a great few days this has been. 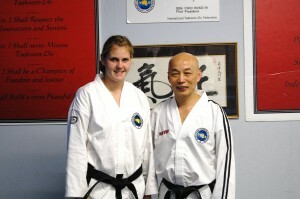 My TKD instructor Mr. LeGrow invited Master Lan (8th degree) to visit from Germany to host a two day seminar. He is their National Coach and has an amazing track record of developing World Champions. Right after playing in the All-Star basketball game I rushed to Blackburn to meet Master Lan. As soon as I walked into the class I could tell there was something very special about him. He instantly earned your respect but he was so humble, gentle and kind so he wasn’t intimidating. He has a little twinkle in his eye that makes you feel comfortable. You could tell how passionate he was about TKD. After class my instructor asked if I could miss school on Friday to have some extra training with Master Lan. I couldn’t wait! He also invited one other 20 year old guy who takes TKD very seriously. Mr. LeGrow told me that the training would be at the Scotiabank Place. He teaches fitness classes there a few times a week so I just figured it was going to be in one of those rooms. He surprised us by having our training in the bowl of the stadium. It was so incredible walking into the centre of the rink (no ice) and see just how huge the place is when there isn’t anyone else there. I just keep thinking that all my friends were at the exact same place 12 hours earlier for the Taylor Swift concert. SWEET! The whole experience was so cool. There I was having Master Lan critique my patterns right in the centre of the bowl. When I did my spinning jumps or stomping motions it really hurt my bare feet since it was on the concrete but I wanted to do my best for Master Lan. My coach and Master Lan talked a lot about how it feels to compete in such a big venue with so many people and the extra pressures so it was a good experience to be in that environment. 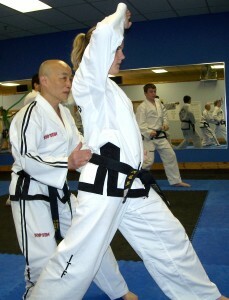 Master Lan spent a lot of time talking about the “Do” in Taekwon-Do which is the mental aspect of the art. He shared all his philosophies of how to prepare mentally for competition. I have to admit I got butterflies in my stomach when I stood there and visualized what it would be like competing in New Zealand in a similar building. It wasn’t scary, just exciting. I was so disappointed that my mom didn’t have her camera with her so I took some pictures with my cell phone. We really weren’t expecting to train right in the stadium. Training in the bowl at the Scotiabank Place - wow! I was exhausted after the session since I was concentrating so much and I was still tired from the training the night before. 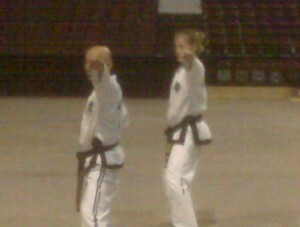 After a nap I went to the dojang to watch Mr. LeGrow test for his 6th degree. The test went until 11:00 p.m. I was so proud of him since it was a really hard and long test. He did an amazing job and was promoted to a 6th degree. You become a Master after you pass your 7th degree test but he won’t be able to test again for a few years. Master Laquerre came from Trois Rivieres to test him and the room was full of spectators as out of town people started to arrive for the weekend. The seminar started Saturday morning at 9:00.am. There were 45 students in total from Ottawa and Quebec. Master Lan focused on sparring drills for most of the day. 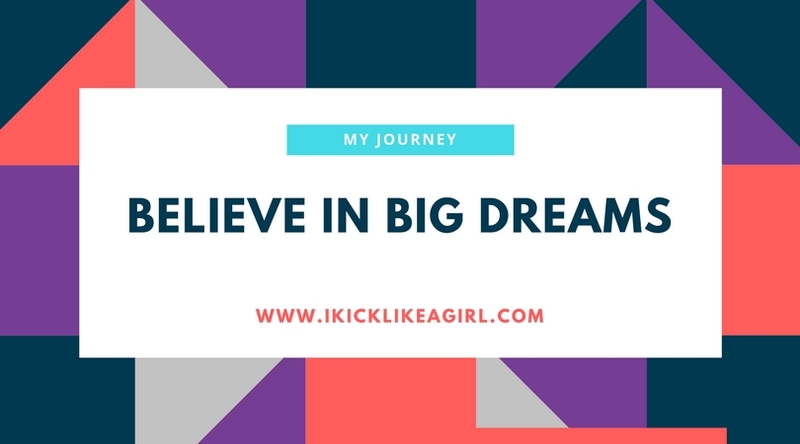 I really learned a lot and it was also reassuring of things that I have been doing. It’s great to be able to practice some strategies on people that I will actually be competing against without the pressure since it’s just practice. Master Lan completely impressed me with how flexible and strong he is. 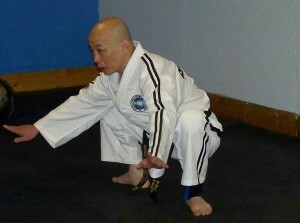 He is 60 years old and has been studying TKD every single day for 45 years. He has so much energy but he’s so calm. 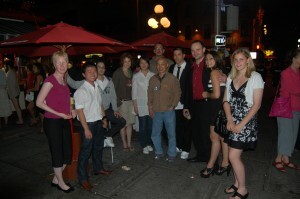 Saturday night a large group of us went out to a Japanese restaurant downtown to welcome him to Ottawa. I am slowly learning how to eat with chop sticks :). It was a beautiful night and Master Lan wanted to go for a walk after dinner so that is what we did. Since we were already in the Market area we walked and bought him a local favorite – a Beaver Tail! He loved it!! Then he wanted to walk more – so of course, we did. We walked all around the Parliament building to look at the beautiful laser light show and all the lights over on the Hull side. I was walking in a dress and high heels so that was also a new experience for me :). During the whole walk Master Lan continuously talked about TKD. I just wanted to hear him talk forever. I was learning so much. The whole night was perfect and so special. I’ll never forget it! 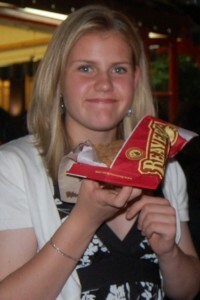 Gotta Love the Beaver Tails! Sunday morning started again at 9:00 and I was surprised that I wasn’t tired. I couldn’t wait to start training again. The morning focused primarily on Patterns. Master Lan really emphasized on the way to breathe for each technique. He said that if the pattern was done properly then he should be able to close his eyes and tell you which pattern you were doing just because of the sound. The cool part was that he actually tried it, and it worked. I have always worked on getting a strong breath but I have now learned how to change the breaths for different techniques of the pattern. 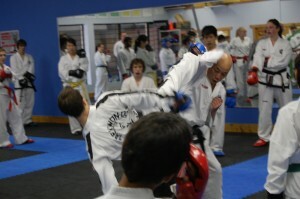 After a lunch break we did more sparring drills, some normal sparring and then some more patterns to finish off. Master Lan gave us each a signed picture of himself and on the back he wrote a personal evaluation of our patterns and our sparring abilities. It was like a prescription of how to improve. He spent the last hour calling us up to the front one by one and he told us what we were doing right and what we need to work on. It was amazing how accurate he was on everyone just after watching us for a few minutes. It was great to get the feedback. I learned so much and it was great to get into the right head space of sparring and competing before the CanAm’s in two weeks. He talked alot about the mentality you have to have when you are sparring in a training season vs. the mentality of being in the sparring ring during competition. It was a bit weird realizing that my competitors in the room where getting the exact same advice on everything. Now it just comes down to who can follow through with his advice at the time of competition. He believes that everyone should have the same tools and he has no secrets. It’s all up to the students if they want to incorporate his lessons. I have several hours of video from the weekend so I’ll be able to review it when I need to. Since it’s the long weekend I am really looking forward to a day of rest and to digest everything that happened. Master Lan leaves on Tuesday night but a few other students and myself are going to train with him in the morning before he has to catch his flight home to Germany. This is definitely a week that I’ll never forget!!! Thank you Mr. LeGrow for giving us this amazing opportunity. Wow what a weekend. We have heard a lot about Master Lan – from Ms. Trigger. unfortunately she was very sick over the weekend an missed most of it. I heard all about Mr.LeGrows testing…absolutely amazing. I have stopped classes as I hurt my back, but Cameron is still going. He hopes to test in June for his Blue Stripe!